Shortlisted in the German Language Edition category of the ICAS book prize 2017. Christianity was initially a “foreign religion” in China, nevertheless it took roots over the course of several centuries through the process of evangelisation, negotiation, conversion, and contextualization. Therefore, it constitutes a rather complex cultural phenomenon in China. It has been, and still is, viewed from several perspectives and embedded into various, sometimes mutually exclusive, master narratives of Chinese history, e.g., Cultural exchanges between China and the West, Imperialism in China, Modernisation of China and Chinese religious history. Each of these narratives entails a different evaluation of the history of Christianity in China. As this study in German points out, changes in this field of research are an apt indicator for shifts in the conception of national and cultural identity/alterity in Mainland China. They also reflect different perceptions of the relationship between Christianity/Christian groups and Chinese culture/non-Christian population as well as between China and the West. 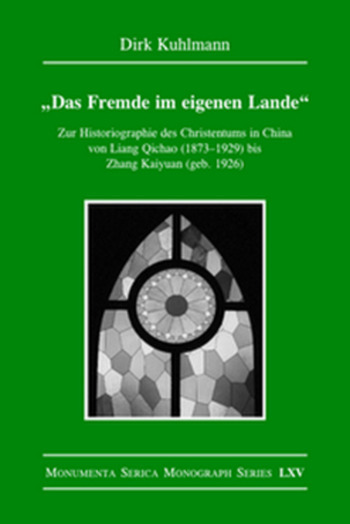 Based on an analysis of discourses on the historiography of Christianity in China, the author demonstrates the interplay of historical research with Mainland Chinese debates on meta-topics such as paths of modernisations and identity. The focus of this research is on the contributions of Liang Qichao (1873–1929), Hu Shi (1891–1962), and Chen Yuans (1880–1971) for the early 20th century. For the late 20th and 21st century relevant articles from the leading historical journals Jindaishi yanjiu (Modern Chinese History Studies), Lishi yanjiu (Historical Reserarch) and Zhongguoshi yanjiu (Studies in Chinese History) are discussed. In the evaluation of these articles a special emphasis is put on the influence of the historian Zhang Kaiyuan as a pioneer of a new research perspective.